Where did my weekend go? I had to replace the faucet in the kitchen and a couple of light switches. Any home project seems to involve a minimum of 3 trips to the hardware store. Yuk. 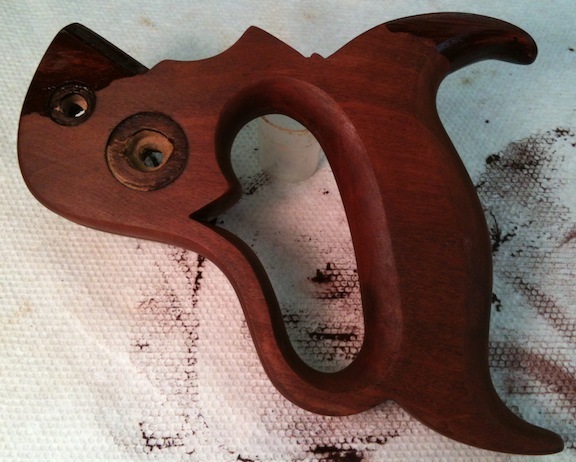 I did most of the refinishing on my saw handle, although I still plan to put a few more coats of Shellac on it. I started out by sanding it smooth, starting with 80 grit on the rasped areas, then 120, 220 and 320. I wasn’t sure how to proceed, and I probably rushed things a little. No patience. Next Day Air is an interminable wait for me. I had thought about bleaching the handle first to try to average out the colors, but didn’t wan’t to wait for that to work. So I put a little Georgian Cherry gel stain on the patched areas and let that sit a few minutes. 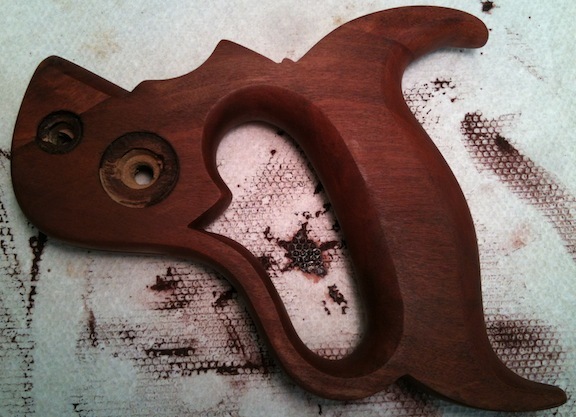 Then wiped a quick coat over the entire handle. There was still too much contrast, so I put another coat of stain on the patched areas. Then I put on one coat of plain boiled linseed oil. Again, probably too soon. It removed some of the stain. I rubbed more on the patches and left it alone for an hour. Then I started applying coats of Garnet Shellac. I put a few coats on, let it dry, sand it with a 500 grit norton sponge and some linseed oil for lubricant, then apply a few more. This is after the first coat. 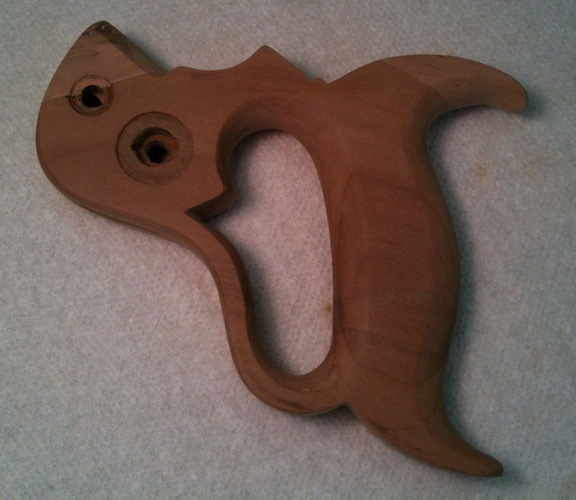 I will sand and apply more tonight, hopefully that will get me to the glossy finish I want – it’s mostly there already. 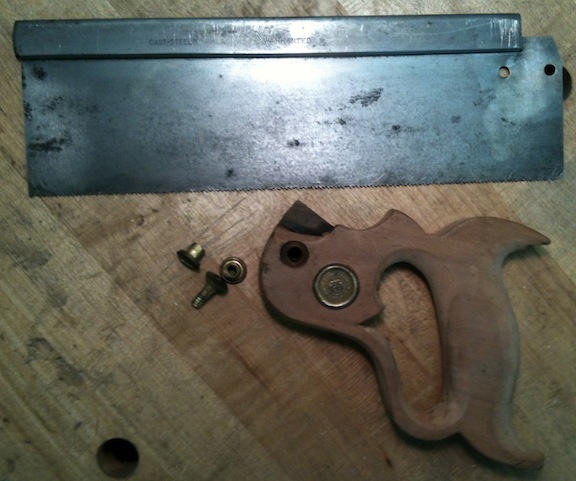 I also cleaned the saw plate and sharpened it. I’m not happy with the job I did filing it. The files I bought have too much radius on the corners, and I probably should have just re-toothed it from scratch. I may still do that. 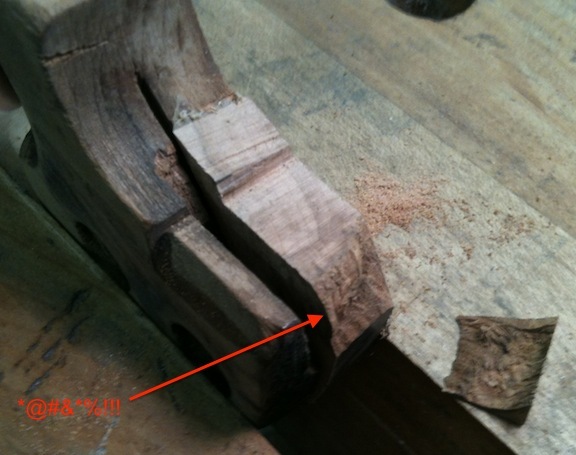 I think it’s around 15ppi, probably too fine for tenons. It is certainly too fine for my Stanley 42X saw set. Maybe 10 or 11? 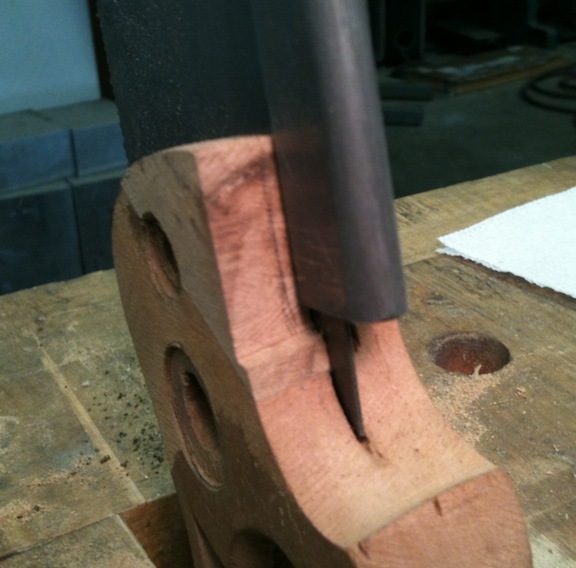 Progress on the tenon saw. 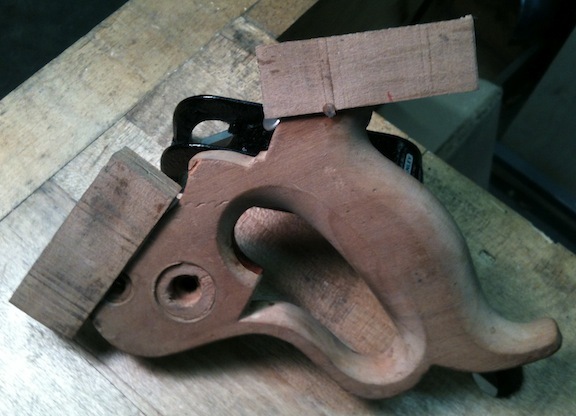 I have the handle rough shaped now…less rough and more shaped. I started off by making a pattern from the lower horn, then aligning it and tracing around it onto the top patch. I have a handful of rasps that I’ll be using. These things are kind of unbelievably pricey, especially compared to the hardware store tools. They are kind of unbelievably better too. The two large ones (one coarse, one fine) I got a while ago from Stewart-MacDonald, who sells them for instrument building. 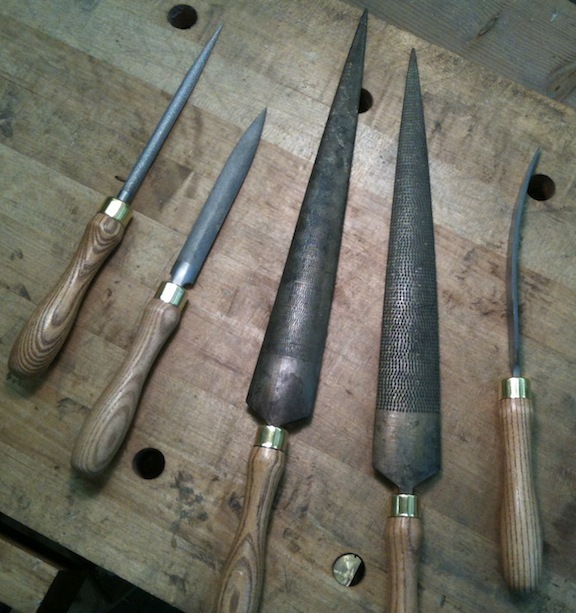 The three smaller ones came from Tools For Working Wood. I ended up using primarily the large 10″ fine cut, the small cabinet rasp (2nd from the left) and the curved saw tote rasp. That last one was handy, but you could do the whole job with just the one cabinet rasp. At this point I was pretty confident, I was sure I could rasp the handle into shape. 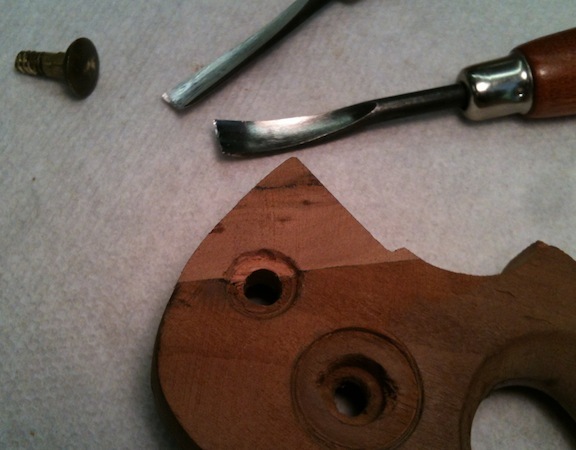 On the second or third stroke I poped a chip out of the replacement wood. There was a tiny knot in that part, but I didn’t really think about it being fragile. I super-glued it back in place and continued on. Well, I super glued it to my fingers first. 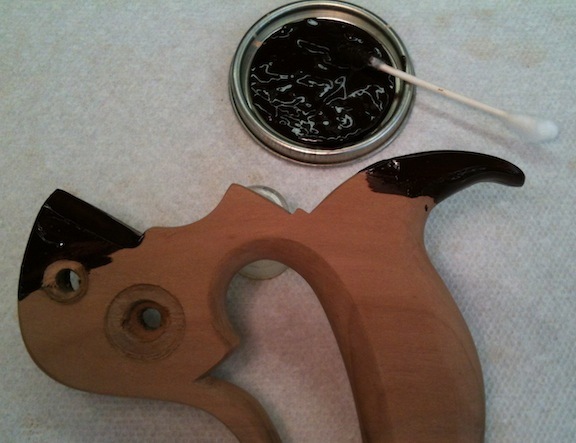 Then I glued it to the handle. Always something. My approach for shaping the patches was to first get the profile – the side view – in good shape. 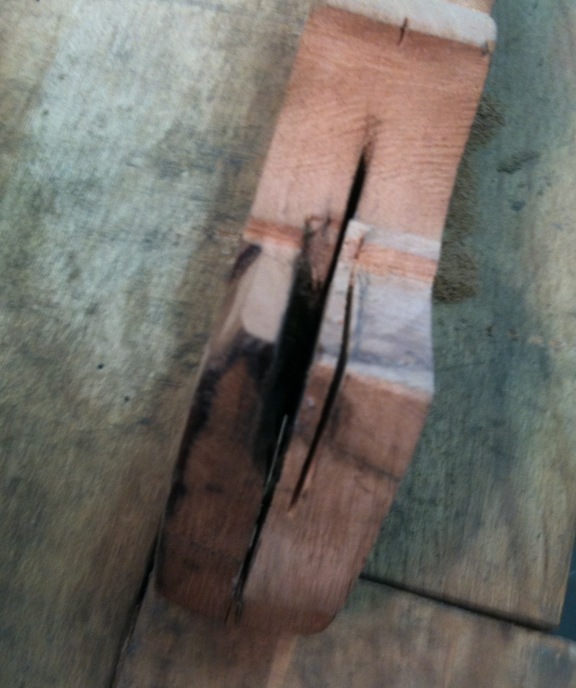 Then I used the rasp to flatten the extra material from the two sides. The horn still needs more curve underneath, but it’s close. While I was working on the 2D views I drilled the hole through the patch. 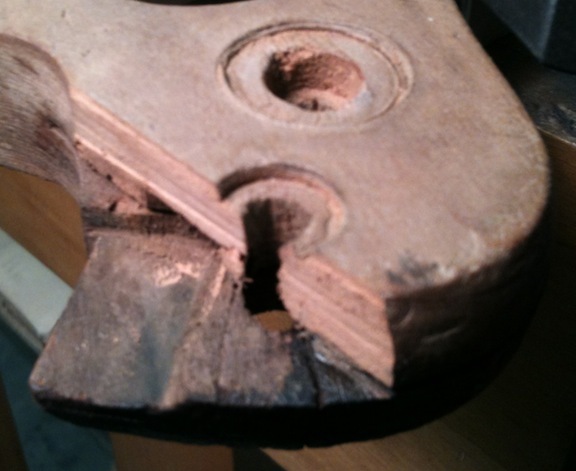 I traced around the fastener to get the size for the recess and used a couple of small chisels to remove the waste. I had to make the notch for the saw back. I wasn’t really sure how to approach this. I slipped the blade in and marked approximately where the notch needed to be. It struck me that I could cut this with my dovetail saw, like the pins on a half blind dovetail. So I did. Then I chopped out the waste with a small chisel and pared the sides and bottom so that the blade would fit. It wasn’t that hard, but I’d been worrying about it. Whew! 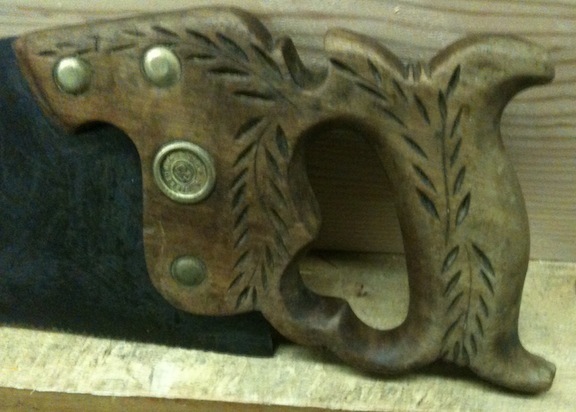 Next I blended the horn into the handle. This is sort of a gut-feel thing. I rasped it until it was blended initially, then held the grip to see how it fit and looked at the shape to see if I liked it. Then I removed more material, and checked it again. I also rasped in the bevel on the sides of the notch for the saw back. At this point the shape is at least 95% there. I’ll refine it a little with the initial sanding. All of this work took maybe an hour. Less time than it took me to edit the pictures and post them here. 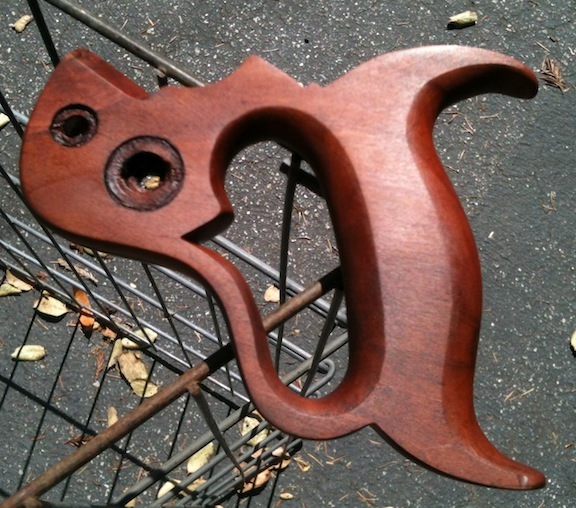 I’m still waiting on the finishing supplies I ordered, but I’m eager to get some finish on the handle. The color match with the wood is terrible, so I’m not sure what the best approach (short of black paint) is. I’m thinking I’ll stain it, maybe working in more stain on the patched areas. 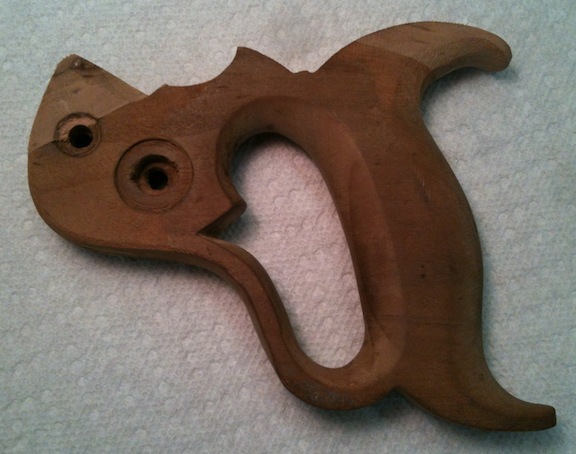 Maybe bleach the original handle wood? The grain isn’t a problem, but the color is distinctly different. While I’m pondering finishing I’ll sand the handle and clean up/sharpen the saw plate. 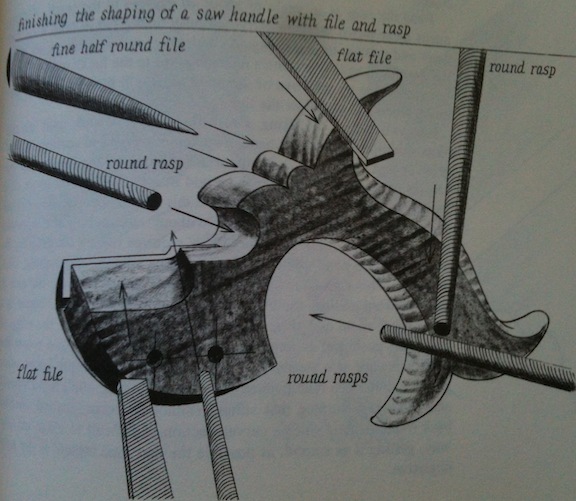 I got this picture from Watson’s “Hand Tools” book, which has great illustrations. I’m really growing to like that book. At first it seemed like a repeat of information I already know, but it’s still useful. Between making dinner, getting my son to do his homework and getting him off to bed I managed to make a little progress on my tenon saw handle. 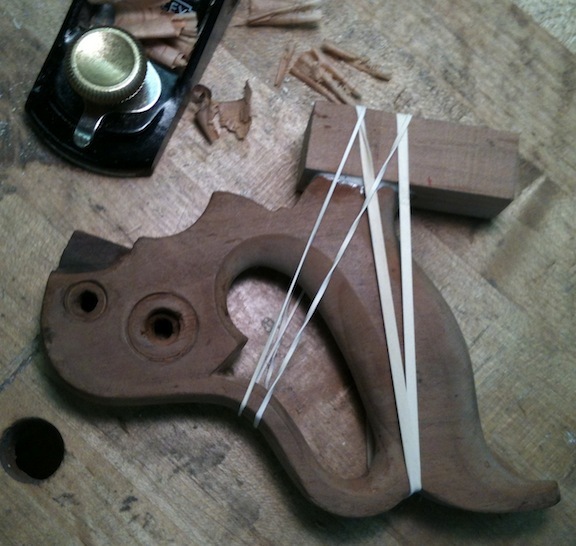 First I planed the top horn, until I’d removed all of the chipped horn. I would have preferred to have the glue line parallel to the grain, but I didn’t have enough Apple scrap to do it that way – it would have removed a lot more of the handle. I also cut off a small bit of Apple wood and planed one face so I’d have a decent surface for gluing. I don’t know about the color match — the wood on the handle has a deep, even red color. The scrap I have is lighter and has a more pronounced grain. I may have to stain it or use a dark finish to get it all even looking. 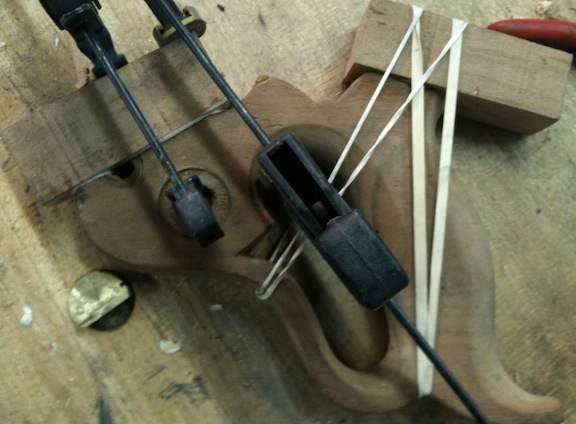 I used some Titebond 3 and a pair of rubber bands to clamp it up. After the glue dries I’ll saw off the excess and rasp it into shape. OK, now what to do about the missing chunk? I laid out a trim line to cut away the damaged wood so I could have a straight joint. This seemed to be the best approach. I sawed out the waste, but couldn’t get a plane in to smooth it out. I pared it with a chisel and then planed the scrap of Apple I had left. Unfortunately it wasn’t big enough to align the grain properly. 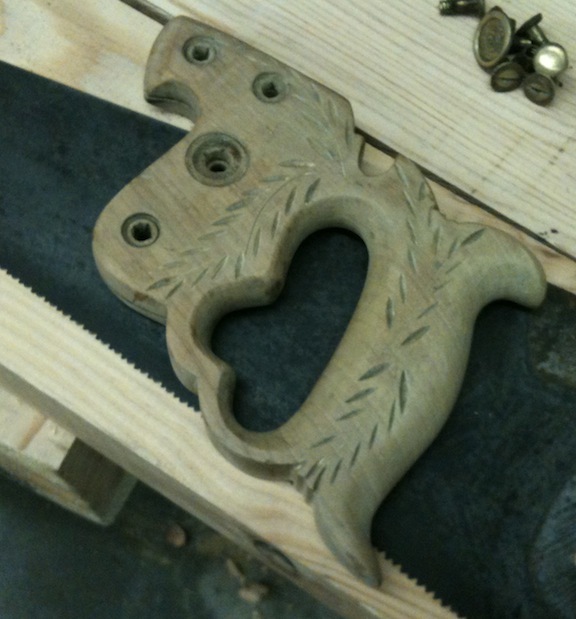 I also planed the side that faces into the saw slot. In fact, I put the saw blade into the slot when I glued and clamped the new part in to make sure the blade slot was properly aligned. I’ll have to chisel out the notch for the back after it’s dried. 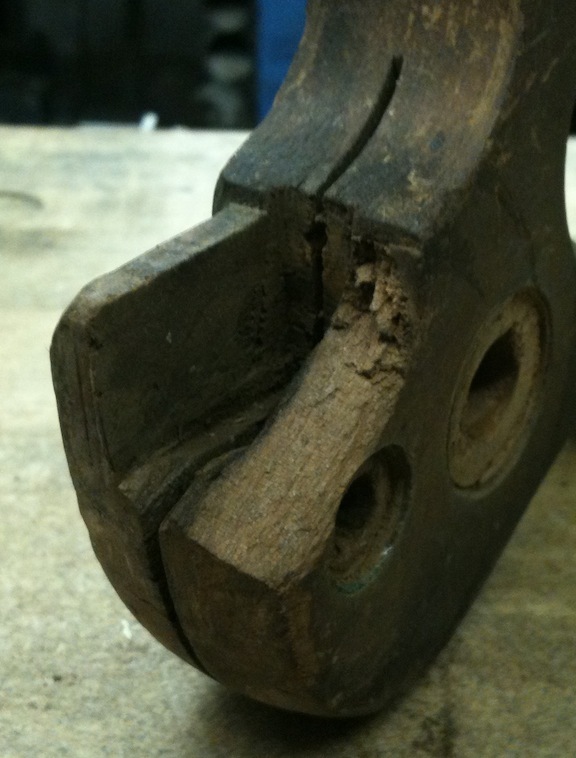 Note that the patch bisects the hole for the saw nut. Not a big deal, I can drill it out from the opposite side. There were a couple of cracks in the handle on the right side I flowed some CA into the cracks to seal them and reinforce the area. 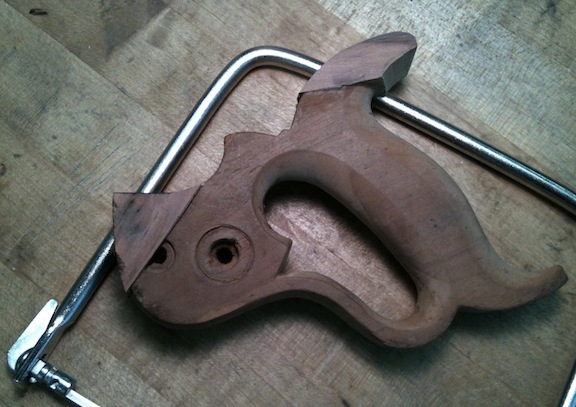 So, the handle is looking a lot like Bride of Frankensaw at this point. I left it to dry overnight before I start cutting and filing. 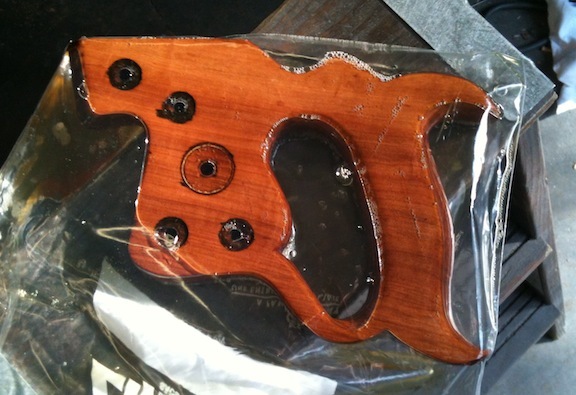 I think it will be a decent looking saw when it’s done. The next step on my saw chest it to make the lid. To do that I need a tenon saw, a mortise gauge and a mortise chisel. Whoops. 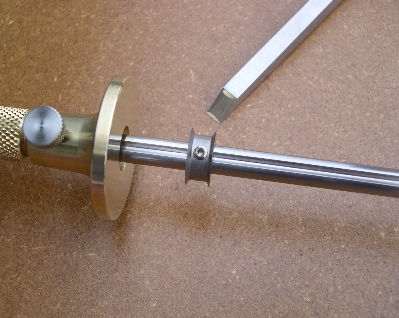 The mortise gauge is on order. 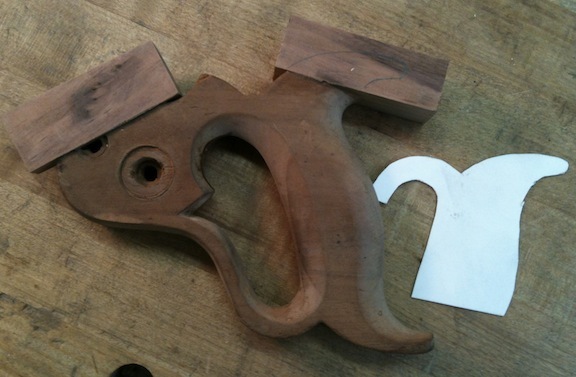 I am getting the 1/4″ mortise blade for my Glen-Drake Tite-Mark. I love my Tite-Mark, but I wish it had a wider base, round bases are needlessly wobbly. 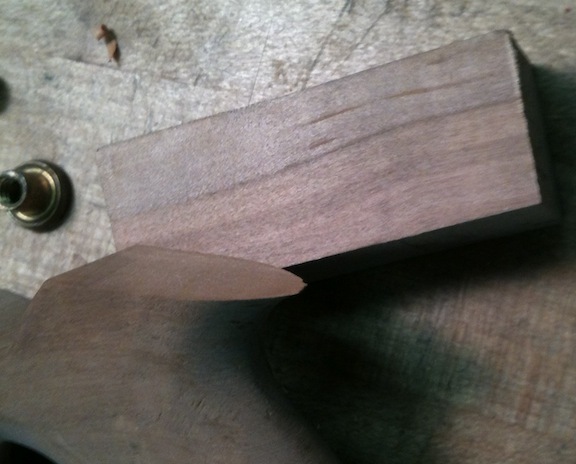 For the mortise chisel I’m re-working an old English mortise chisel. It measured .290 wide, and was rusty, so I’m grinding it to .250″ and will do a general tune up on it. I’ve just rough ground it here, and will be hand sanding it (on a surface plate) to get all of the sides clean and true. Then I’ll sharpen it, and hopefully not poke any more holes in my hands. Finally, I need a tenon saw. I have a Bad Axe Beastmaster that I found on eBay, but it is WAAAY too big to cut a dinky tenon on 3/4″ pine. 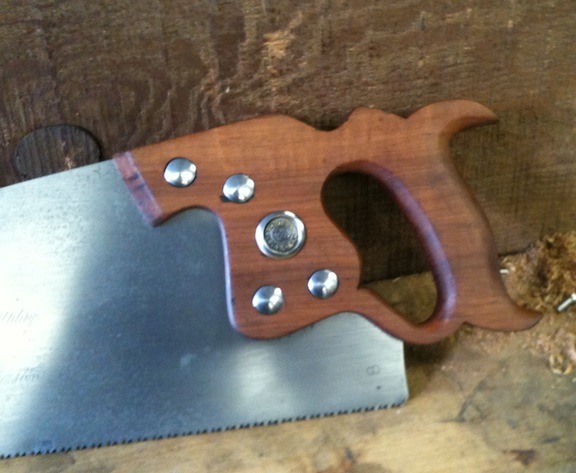 I have another Bad Axe tenon saw on order, but I don’t expect to see it anytime soon (14 to 16 week wait list!). So I picked up this beauty on eBay for cheap. 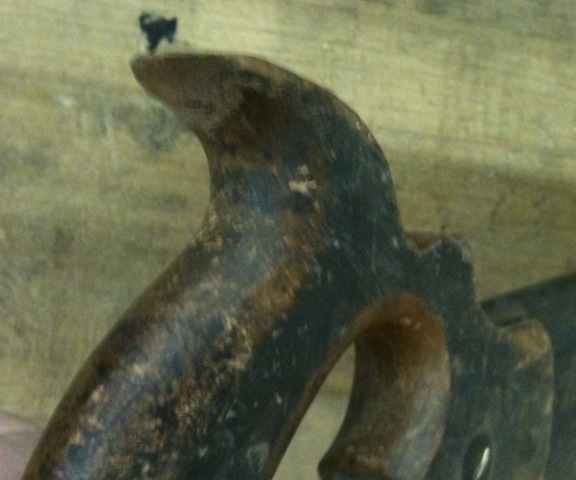 It has a chip out of the horn and a chunk out of the front of the handle. It’s pretty rusty, but doesn’t appear to be pitted. The chip should be pretty straightforward to repair. The chunk I’m a little concerned about repairing. I’ll need to cut out enough that I have a straight, flat area to glue in a new piece. And it needs to be fairly horizontal so I’m not gluing end grain (and to help hide the splice). It will probably go through the screw hole. and it’s right on the groove for the blade and back. First order of business, take it apart. I scrubbed the handle with a scotchbrite pad in acetone and got all of the old finish and dirt off. 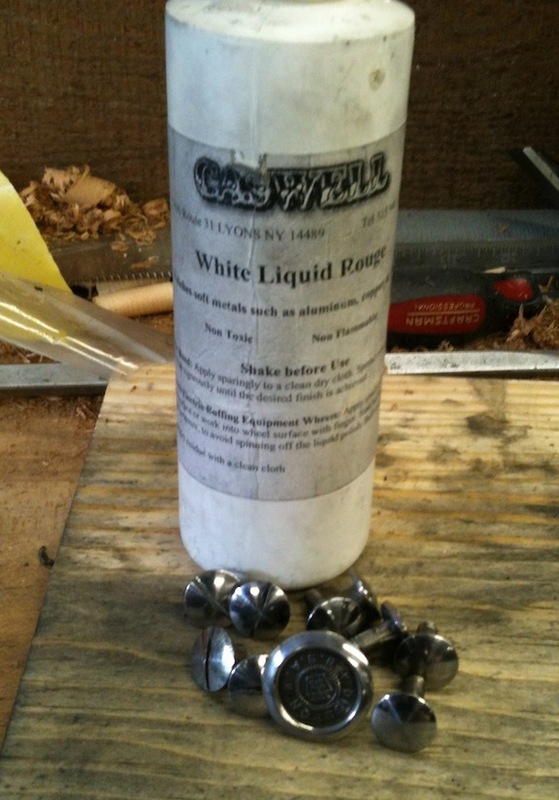 I cleaned the saw nuts in acetone too, I’ll polish them before I put it back together. 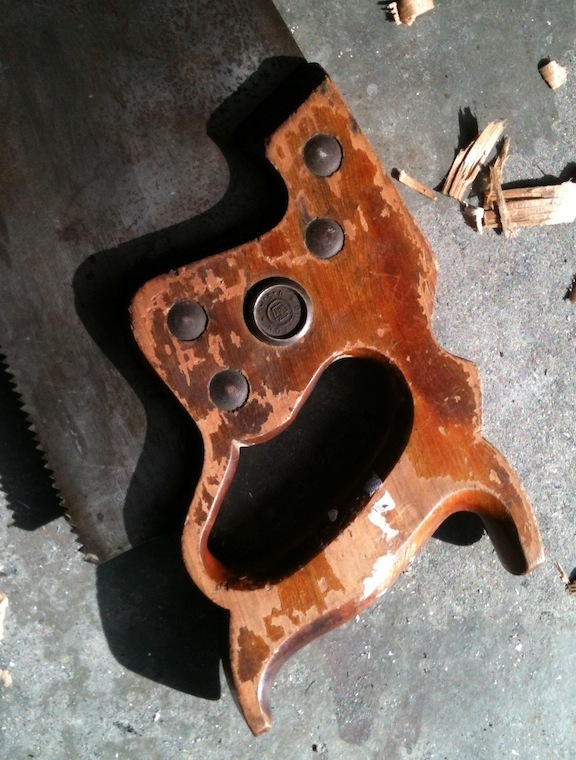 The saw plate I treated with Navel Jelly rust remover, two applications. 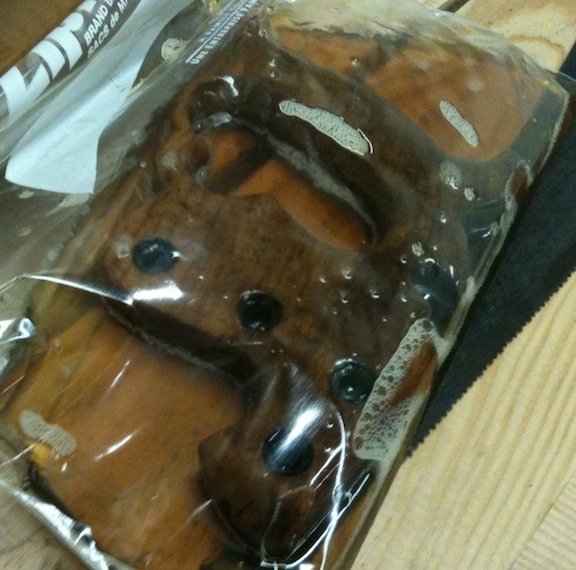 Then I dried it and soaked it with WD-40 to keep it from rusting inside the back. I don’t want to take the back off if I don’t need to. Fixing up the plate is going to be simple, just some detailing and then re-sharpen it. The handle will take a little more effort, so I’d better get to it. 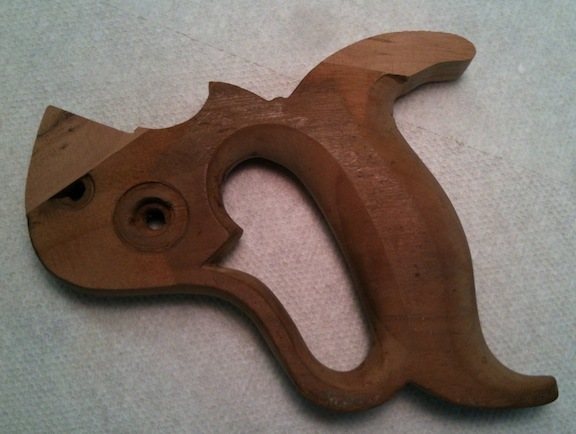 I started out on the road to hand tool woodworking with an inexpensive pull saw from the big box store, then I restored a Disston D8 and had Dr. Phil at Bad Axe sharpen it. Now I’m Hooked on Hand Saws(TM). I won’t bore you with the saws that have recently feathered my saw nest, but I decided that I needed to learn how to sharpen saws myself. Currently all the saws I have are razor sharp, so I needed something to practice on. Again, eBay to the “rescue”. I got this gem for under $20 with shipping. This is the picture from the eBay listing, but I added the red line. The price was right. It’s a Diston with brass fasteners and a nice handle that looked to be in good shape. The blade, no so much. I actually didn’t notice that the toothline was so far out from being straight. It’s worse in person. The tip is also bent slightly. The bent tip isn’t a huge concern because my plan was already to shorten the saw an inch or two — I want to make a “panel saw”, with a fine tooth rip pattern. Here you can see the disaster that passes for a toothline. 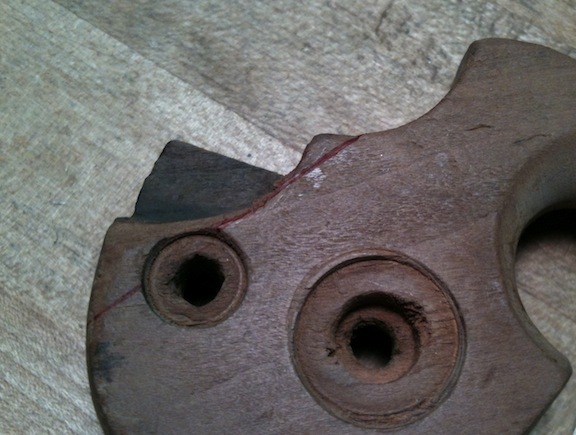 The heel and toe are resting on the surface, there is at least 1/4″ rise in the middle. Before the saw arrived I was thinking that I’d re-sharpen and re-shape the teeth, but after looking at the saw it really needs to be re-toothed. I’m thinking that I’ll scribe a straight line from the heel to the toe and shear it off, then file in new teeth. But first I think I’ll sleep on it. 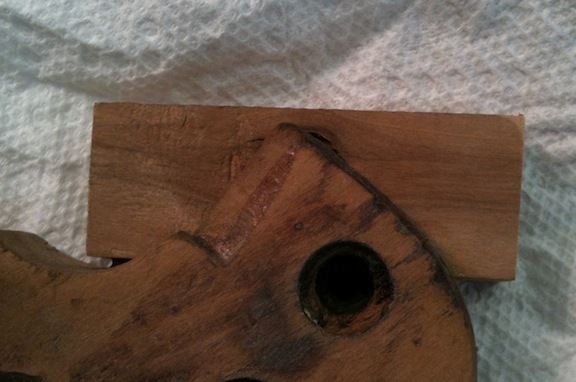 I don’t know how well you can see this, but about 2″ back from the toe there is a distinct bend in the blade. It could probably be straightened, but I’m pretty sure I’ll just shorten it. If I shear the toothline so it’s straight the tip of the saw will come to a point anyway, shortening the length will mean less metal to remove along the working edge. I really like the shape of the handle. It’s not in terrible shape, although it has it’s share of nicks and dings. So, after work tonight I disassembled the saw. I striped the handle with lacquer thinner and steel wool. That got a lot of dirt off, and the tiny bit of finish that was still on the handle. Then I sanded out the worst of the nicks and chips, and gave the handle an overall sanding with 220 grit. There is a little loss of detail in the carving, but it’s not as extensive as the picture makes it look. 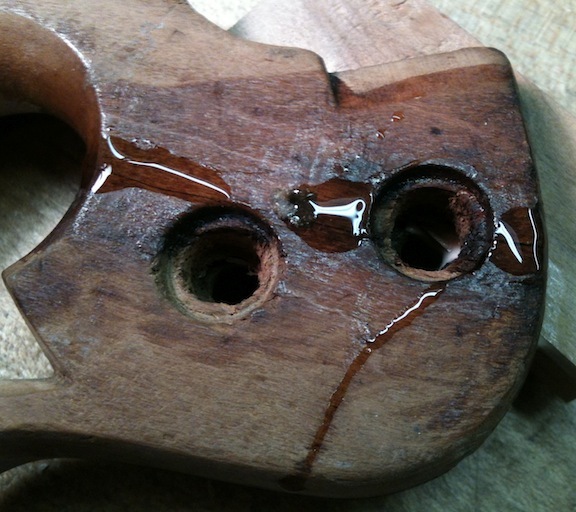 And finally I dropped the handle in a bad of “danish oil” to soak for a few hours. I’ll pull it out later and let it dry overnight before putting some varnish on it. I used a similar procedure on the handle for the D8 that I restored and it really seemed to bring out the color in the handle nicely. 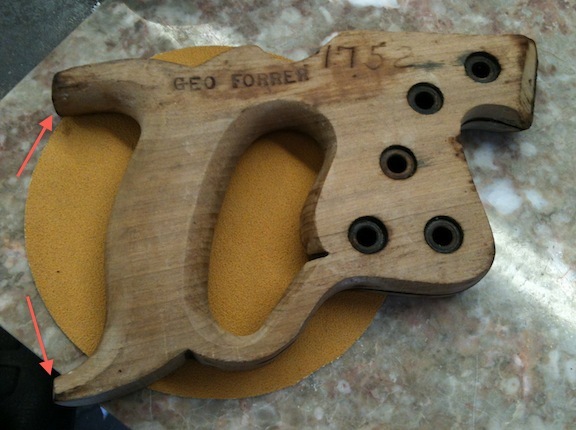 Tomorrow, time permitting, I’ll start on the saw plate.